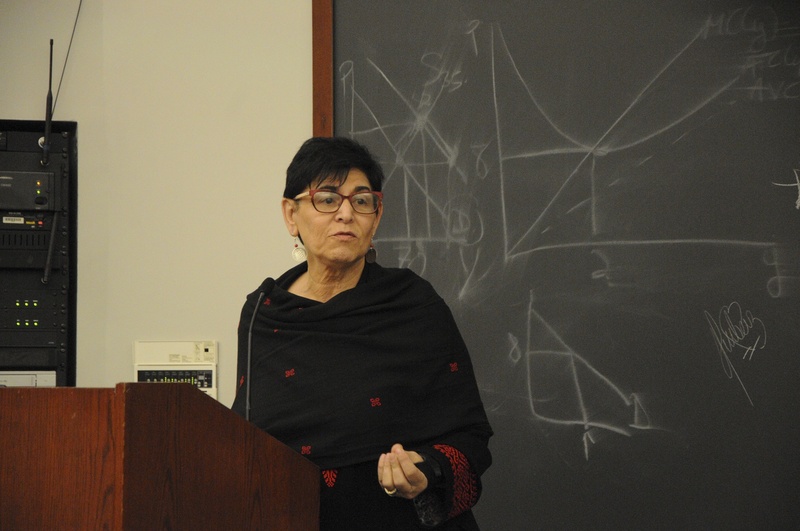 San Francisco State University professor Rabab Abdulhadi speaks at an Israeli Apartheid Week event on April 4. UPDATED: April 11, 2019 at 2:54 p.m. The Harvard Palestine Solidarity Committee hosted Israeli Apartheid Week this past week, aiming to raise awareness for Palestinians who “suffer brutal occupation and oppression,” through a series of events including performances and speeches according to the week’s Facebook page. Some students and Harvard affiliates, however, have said they disapprove of the programming, sparking heated conversations about whether the week’s events – as planned — have a place on campus. The events attracted negative responses on Twitter from United States Senator Ted Cruz (R-Texas) and former University President Lawrence Summers. “Israeli Apartheid Week is an international movement among college campuses worldwide that raises awareness regarding the plight of the Palestinians and the struggles they face with illegal Israeli occupation,” PSC co-president Christian B. Tabash ’21, said in an interview. During a contentious Undergraduate Council meeting on March 31, students debated the UC’s decision to allocate funds for PSC to host the week’s events. The Council ultimately voted to allocate PSC $2,050. Hillel president Rebecca Thau ’20 said in an interview that she was disappointed by IAW’s choice to take an “anti-Israel stance” rather than a “pro-Palestine” or “pro-conversation” one. “It is in my mind concerning that the Undergraduate Council, which is supposed to represent all of the students on this campus, would be the ones underwriting a week that splits apart Harvard undergraduates instead of creating the kind of conversation and debate and learning that we all deserve,” she said. “Our objective is to make that known and to highlight injustices towards a people that has been historically underrepresented, demonized and dehumanized,” he added. The controversy surrounding the UC’s decision and resulting media attention led to College administrators to email the PSC about concerns they developed over student safety during the week’s events, specifically at the Black-Palestinian Solidarity event Tuesday. Associate Director of Student Organizations and Resources JonRobert Bagley sent an email to PSC, a copy of which The Crimson obtained, Monday evening notifying the group that he would sit in the event as an observer. He added that the Harvard University Police Department would be required to be at the event and PSC would be charged for the security costs. Radhika Sainath, a lawyer for Palestine Legal — a a nonprofit that "protects the civil and constitutional rights of people in the U.S. who speak out for Palestinian freedom," according to its website — emailed Dean of the College Rakesh Khurana and Dean of Students Katherine G. O’Dair requesting an explanation of why Harvard was not paying the security fee on Tuesday. She also asked whether the event would be allowed if PSC declined to pay the fee. “Students and professors and and community members should be able to gather and to hear and to listen to these debates, to these talks, and to these other perspectives without fear of censorship or having to pay extra money,” Sainath said in an interview on Friday after the event. Sainath added in the interview that Harvard administrators said they would not charge PSC for any security costs. Bagley apologized to the event organizers for attempting to charge the fee during at Tuesday’s event, according to a statement from Palestine Legal. Bagley did not respond to multiple requests for comment. The event featured former CNN contributor and Temple University Professor Marc Lamont Hill, African American Studies Professor Cornel R. West, and Dima Khalidi, founder and director of Palestine Legal. The goal of the event — which more than 200 people attended — was to discuss the importance of “mutual solidarity between the Black Liberation Movement and the Palestinian struggle against Israeli injustice,” according to the Facebook event page. In collaboration with several other campus organizations, PSC also unveiled a Wall of Resistance in the Science Center Plaza on Wednesday evening. The rest of the week’s events included a rally commemorating the Great March of Return protests in the Gaza strip border with Israel, a performance by Palestinian poet and activist Remi Kanazi, a screening of “1948: Creation and Catastrophe,” and a talk titled “Demystifying BDS” by Rabab Abdulhadi, a professor at San Francisco State University. BDS — short for Boycott, Divestment, Sanctions — is an international movement that “works to end international support for Israel's oppression of Palestinians and pressure Israel to comply with international law,” according to its website. PSC also sponsored a student panel titled “Voices of Palestine” on March 31. Panelists — including Palestinian students at Harvard, an MIT student who lives in Gaza, and Oren R. Or ’22, an Israeli Jew — shared their experiences living in Palestine and Israel. A previous version of this article incorrectly referred to PSC co-president Christian Tabash as PSC's president. A previous version of this article incorrectly stated that Palestine Legal co-sponosred the Black-Palestinian Solidarity event. In fact, the group did not sponsor the event. — Staff writer Elizabeth X. Guo can be reached at elizabeth.guo@thecrimson.com. Follow her on Twitter at @elizabethxguo. — Staff writer Amanda Y. Su can be reached at amanda.su@thecrimson.com. Follow her on Twitter at @amandaysu.